The performance tuning market is one of the fastest growing and highly profitable segments in the automotive replacement industry today. Car enthusiasts are spending increasing amounts of money each year on engine modifications. 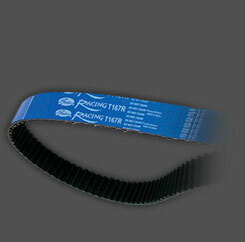 Gates presents an excellent opportunity to tap into this sector with tremendous turnovers with a premium quality XTreme Performance Timing Belt. This belt is crafted in Japan with the finest quality materials and easily identified by its blue colored cover material. Specially designed for racing and performance tuning applications. Constructed with high strength tensile glass cord to increase performance and reliability. Turbo-charged engines with increased boost pressure generate large amounts of heat. Heat resistant elastomer gives increased protection against cracking. Modified jacket material provides increased tooth strength. Extensive coverage of popular Japanese high-performance cars.